Authored by: General Editors; William B. Kessel, Ph.D., and Robert Wooster, Ph.D. Native American wars and warfare were a fact of life in North America for thousands of years. This A-to-Z volume concentrates on the conflicts that arose after the arrival of Christopher Columbus in the New World in 1492. From then until the late 1800s, the number of armed conflicts among Native American groups and between Indians and their non-Indian opponents reached significant proportions. 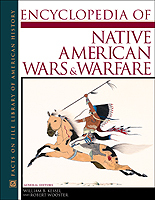 Encyclopedia of Native American Wars and Warfare looks past the legends, misconceptions, biased reports, and myths to present an accurate and objective view of these hard-fought engagements. The book reflects the perspective of both sides, whether the opponents were from different tribes or different cultures, whether Apache or Lakota, American or Russian. Enhanced by 80 black-and-white photographs and line illustrations and 35 maps, Encyclopedia of Native American Wars and Warfare gives readers a richer understanding of the people, places, and conflicts that helped shape North America. "...cut[s] through misperceptions and myths by using the most reliable accounts." "...sharply focused, extensively cross-indexed entries...recommended for public, high-school, and academic libraries."